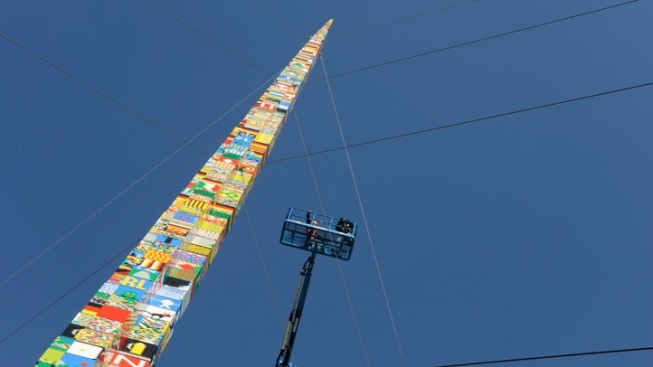 A group of Delaware students broke the Guinness World Record for the tallest LEGO tower. Pictured is a LEGO tower in Munich, Germany in October 2009. A team of students from Wilmington, Del., spent their entire summer vacation breaking a Guinness World Record. The students from John Dickinson High School erected a 112-foot tower of more than 500,000 LEGO bricks – breaking the previous record set by the city of Prague in the Czech Republic, who built a 106-foot tower, according to Gizmodo. Instead of going to camp or on vacation, the students spent their entire summer vacation building the tower. The last brick was put into place Monday in front of Guinness World Record Book representatives.